Cuautla, meaning “where the eagles roam”, officially La heroica e histórica Cuautla, Morelos (The Heroic and Historic Cuautla, Morelos) or H. H. Cuautla, Morelos, is a city and municipality in the Mexican state of Morelos, about 104 kilometers south of Mexico City. In the 2010 census the city population was 154,358. The municipality covers 153.651 km² (59.325 sq mi). Cuautla is the third most populous city in the state, after Cuernavaca and Jiutepec. The city is quite warm year-round. In the winter, there is a slight decrease in both the daytime and nighttime temperatures, and because of Cuautla’s proximity to the Tropic of Cancer and its altitude (about 4,500 feet above sea level), the nighttime temperatures year-round usually average about 57 °F (14 °C). On the other hand, because Cuautla is somewhat close to the Equator, temperatures year-round tend to reach into the mid 80s to lower 90s°F (upper 20s°C to the lower 30s°C) even during the winter, and in spring on many days the daytime temperatures may reach well into the upper 90s°F (upper 30s°C). Cuautla was the scene of one of the fiercest battles of the War of Independence during a siege which began on February 19 and ended on May 2, 1812. The city was taken by forces of the priest and General José María Morelos y Pavón, who defended it against the Spaniard General Félix María Calleja for weeks before having to retreat. The city was founded on 4 April 1829. During the Mexican Revolution Cuautla was the first city conquered by the forces of Emiliano Zapata, who was born in Anenecuilco, just south of Cuautla. The area is a tourist-friendly region with abundant hot springs and health spas/resorts. It features many archeological sites such as Chalcatzingo and indigenous communities such as the Tepoztlán and Tetelcingo among others. Agua Hedionda (“Stinky Water”), classified as one of the important water springs of the world due to its chemical composition, is also located in this little city. These waters have a characteristic smell reminiscent of rotten eggs because of their sulfur content. The Morelos Museum contains artifacts and descriptions about Mexico’s War of Independence from Spain. It honors José María Morelos, whose rebel troops managed to hold off Royalist troops for 58 days. The Museum adjoins the old narrow-gauge railroad which was used to haul sugar cane to the local mills. The narrow-gauge was retired in 1973. The tomb of the famous Mexican revolutionary hero Emiliano Zapata is also located in this city, and every year several festivities are held around the anniversary of his death. The Tren Escénico is a 3 ft (914 mm) narrow gauge tourist railroad offering train rides pulled by an historic steam locomotive once used by the former Interoceanic Railway of Mexico. 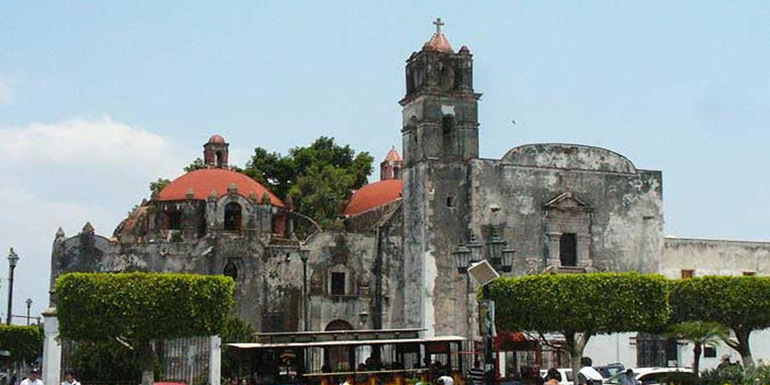 The vast majority of buildings in Cuautla, are made of stone and cement with metal rod reinforcements. Also, many homes in this city, are made with only cinder blocks, cement, and a tin roof. Many of these homes also lack electricity and running water. Nearly all homes have a “tinaco,” which is a large plastic container for water, which is refilled regularly by the city. These containers let water out into pipes which can be opened or closed to wash clothes and dishes, or to bathe. Some roads in Cuautla are not paved. Public transportation is mainly dominated by a metro-bus system. These buses are referred to as “combis.” These buses are small, and can hold up to roughly 10 people. Also, taxis are available, but less common. Cuautla contains many bus terminals, for long distance travels, such as the Terminal Central de Autobuses del Norte (es), with destinations as far as Monterrey, Nuevo Laredo and Ciudad Juarez.